Good morning! Today I'm excited to write about the most common vowel sound that I never knew even existed. 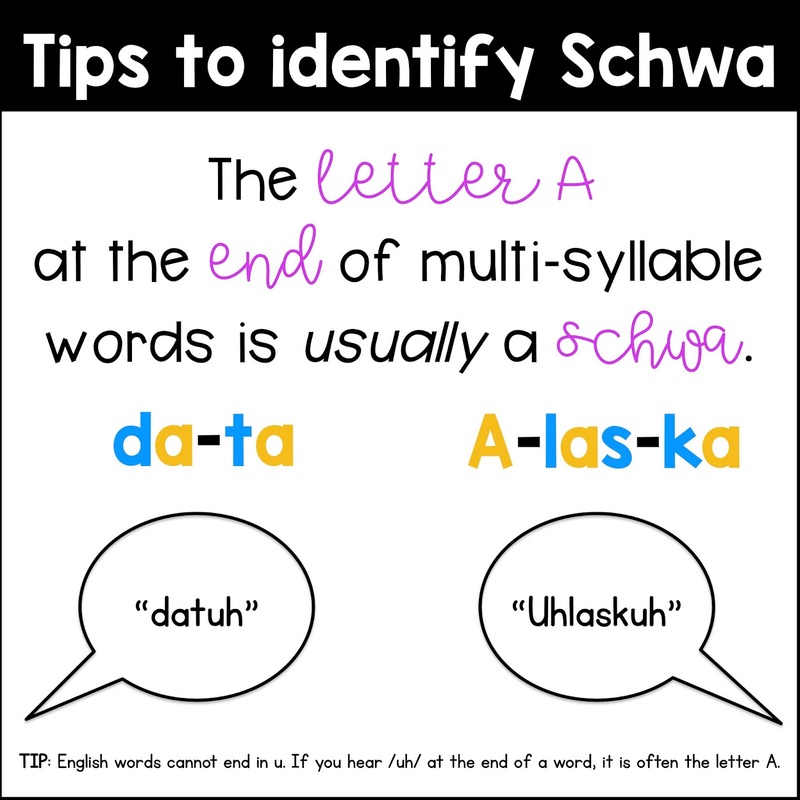 That's right, I got through high school, college, grad school, and several years of teaching and I had never heard of the schwa. 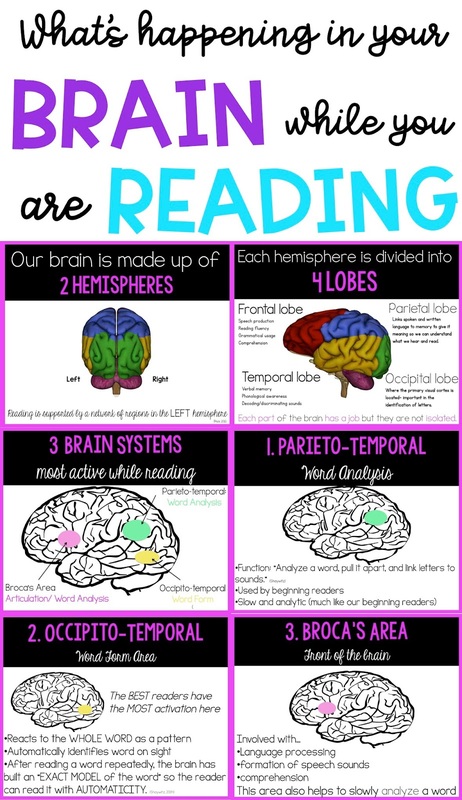 If you've been following me on Instagram or on this blog, you probably know about five or six years ago I really started digging deeper into understanding how we learn to read and why it is so difficult for some people. I went to workshops, took online classes, and started reading books, post, articles, and research about reading and all of its subtopics. The more I learned, the more I realized how much I didn't know! That sentence is a grammar nightmare, but really what I'm trying to say is that the more I learn, the more I realize there is SO much more to learn! Every new piece of information brings new questions, which leads to more reading and research. I've been lucky enough to be able to work part-time for the past several years, which has allowed me the time to do this studying. As a full-time classroom teacher, I never had this time. I would try but quickly burn out because there are only so many hours in the day and there is so much to do as a teacher. I told myself that as I found these answers and tried new things, I would share it with other teachers who don't have time to sit around and study. So here we go! This is what I've learned over the years about the schwa. *Disclaimer* I am not a linguist, although I wish I was! 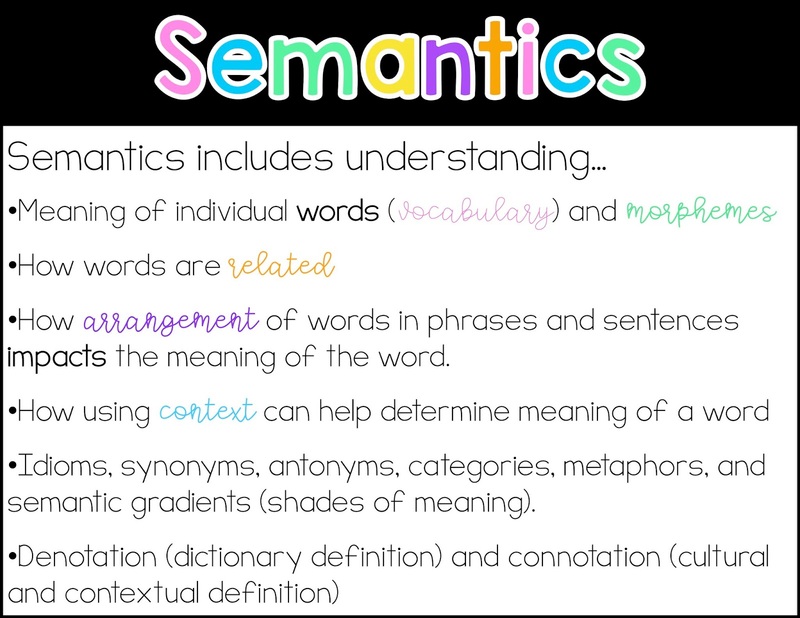 I am not claiming to be an expert, just trying to share what I have learned and how I teach this to my students to help them understand our tricky language. I admittedly struggle with expressive language, spelling uncommon words from memory, and grammar. For that reason, I'm sure you will find grammatical errors in all of my posts! I'm just a teacher who loves to learn and wants to understand all of this. If you read something that is within your expertise (or even just an opinion) that you disagree with, please feel free to call me out on it. I consider that a learning opportunity and welcome open, respectful dialogue. 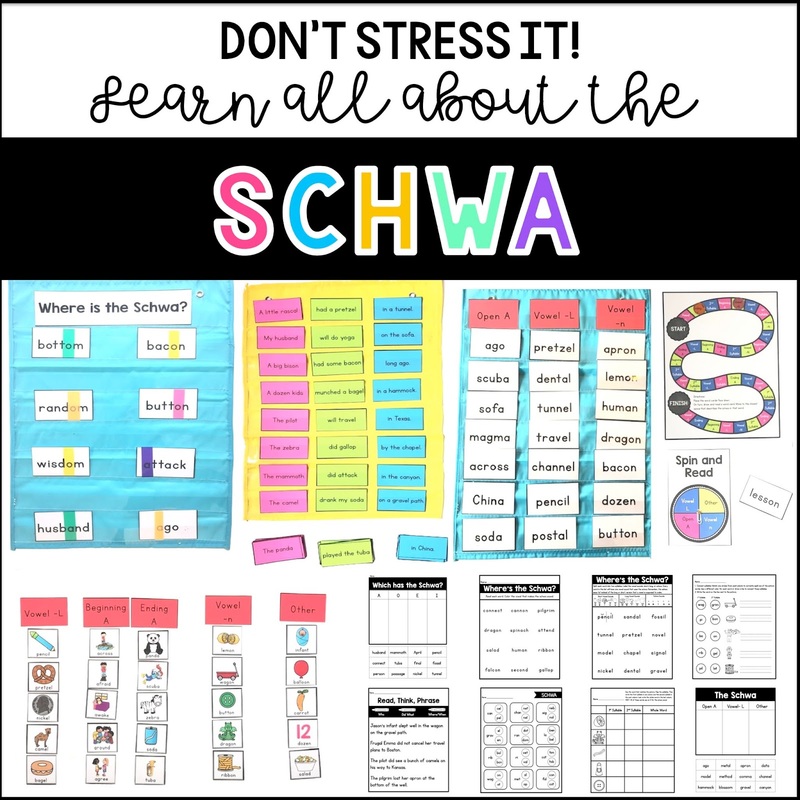 First of all, what the heck is the schwa? Well, think of all those moments when a reader is attempting to sound out a word and they do it perfectly. They say the correct sounds and blend it together perfectly. But wait, they say the wrong word because one of those vowels sounds isn't quite making the sound it's supposed to make. The best example I can think of that always came up when I was teaching syllable division rules with 2-syllable words was pilot. Students are always stumped on that one because they are sounding out pi-lot with emphasis on the lot. I would say, "yes, but say it faster!" They would say pilOt again. I capitalize the O in that so you can hear how they are saying it. Some words, like wagon are easier to adjust. They may sound out wag-on, but then they usually can make that transition naturally. "Oh, wagun!" This isn't the case with pilot usually. So I would tell them how we pronounce it and I would always see confused looks. There so many words like wagon that are easier to figure out and fix naturally but there are also a lot of words that are not as intuitive, like pilot. I would say the more a student struggles with reading, the harder it is to make those adjustments. I will get into more about the schwa and why it happens. Like this says, the schwa is a sound that is represented by all of the vowels. It makes the /uh/ sound, but lazier and not as pronounced. I would also argue it sometimes sounds like /i/ depending on how you pronounce words. I actually pronounce wagon like wagin, not wagun. The schwa sound happens in the syllable that we are not fully pronouncing. We always pronounce one syllable more that the others (more about that in a sec), so that leaves the other syllable(s) to not have as much emphasis. Because of this, our mouths naturally take the lazy route, which is usually the /uh/ sound. Think of how little you have to move your mouth to make that sound. Try saying this sentence enunciating every syllable, using the proper vowel sounds: The camel is pulling seven robins in an orange wagon. See what I mean? It sounds like a robot is talking. 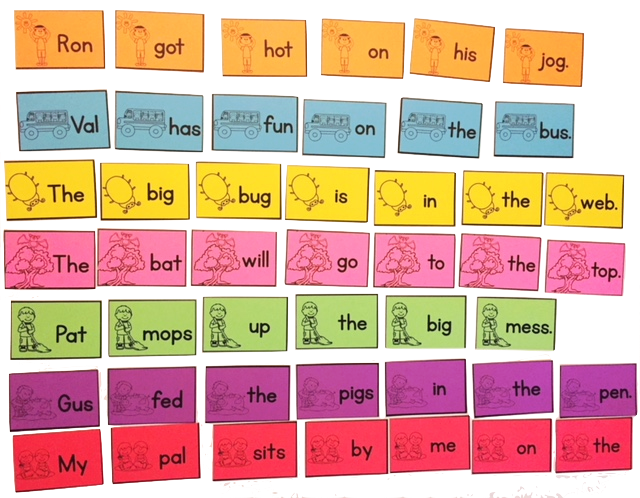 Now say it normally and try to focus on the vowel sounds that are sort of dropped or making the /uh/ sound. It probably sounds like this: The caml is pulln sevun robns in n orunge wagun. 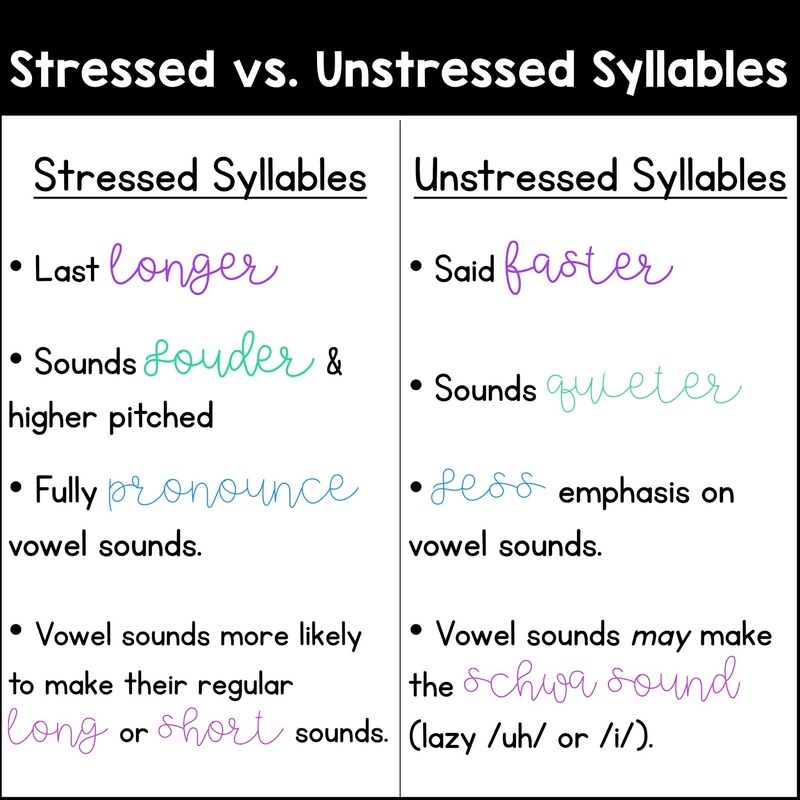 So now a little bit more about where we find the schwa: The unstressed or unaccented syllable of a word. The schwa is found in the unaccented syllable of a word. Like I said, we only stress one syllable. That leaves the other(s) to not be as enunciated. I think these two words are super helpful in understanding that. Say these two words in the sentences to hear how the stress changes. 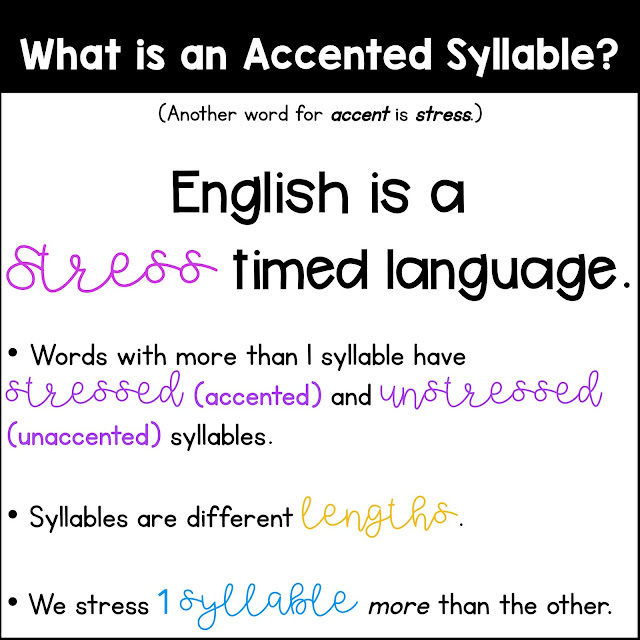 With the first example, That is good content, the stress is in the first syllable. We say con a little longer, louder, and even higher pitched. In the second sentence, I am content sitting here, we stress the 2nd syllable tent and sort of mumble con. There happens to be a scha in the con in this usage. Do you hear it? With our mumbling, we end up pronouncing it cun. Notice there is not a schwa in con in the 1st example. 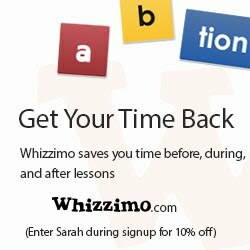 This website has a super helpful video that explains it well and gives examples so you can better understand the concept of a stress-timed language. So back to the schwa. Now that you know what it is and where you may find it, let's talk about some common places where you may find it. The tricky thing about the schwa is that there no way to know exactly where it will be when you are reading. 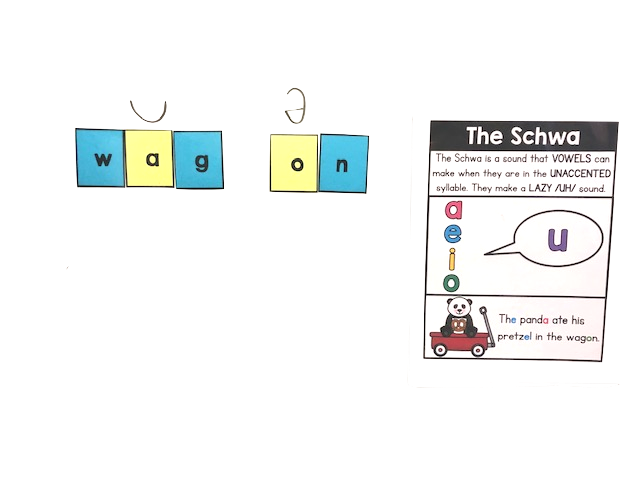 Students have to sort of sound out the word normally then make the adjustment to the schwa sound. This can be so tricky! So truly, my first tip is not the best around, but this has been the best solution so far with my students. I teach my students to decode the word as they normally would. 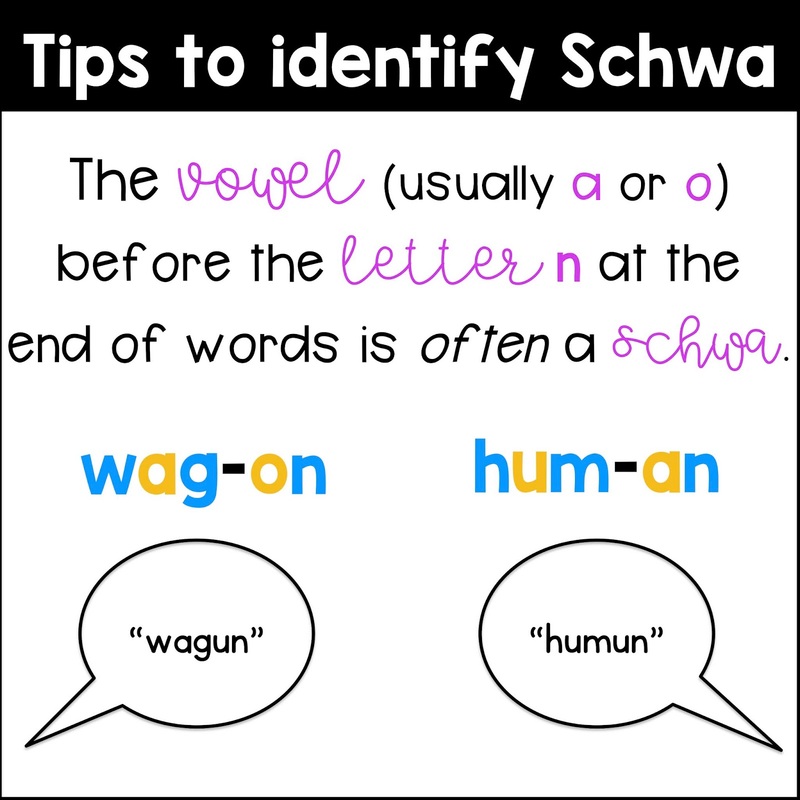 If the word doesn't sound like one they know, try to substitute the /uh/ schwa sound in one of the vowels first. 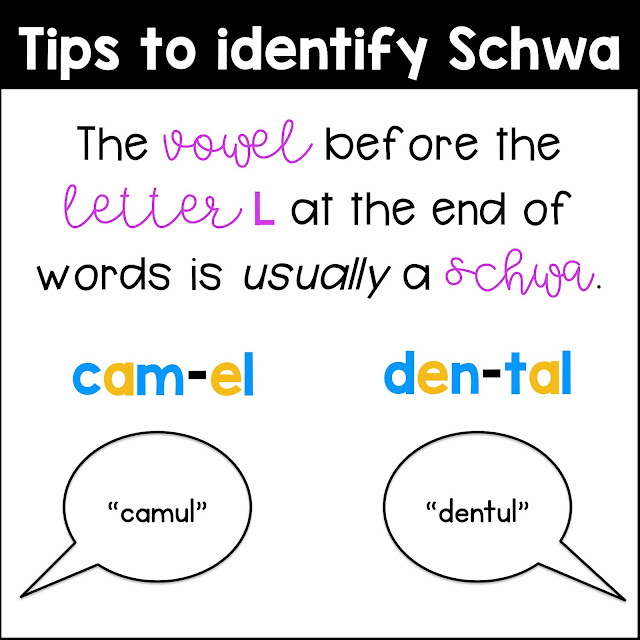 The schwa is more often in the 2nd syllable so I always encourage them to try that first. For example, when they sound out bay-cOn, they can try substitute the /o/ for /u/ and say bay-cun. I wish I had a tip that would work every time and make it easier, but... I do believe this is when context is so important. I always want my students to use their phonics and morphology skills but context is super helpful with the schwa. If you are reading the word bacon in a sentence, you're much more likely to self correct bacOn to bacun if it has words around it that provide context. Aaaaaaanywaaaay... this is one easy schwa tip that actually works (sofa, comma, panda are some examples). Here's another tip, but it's a bit trickier. 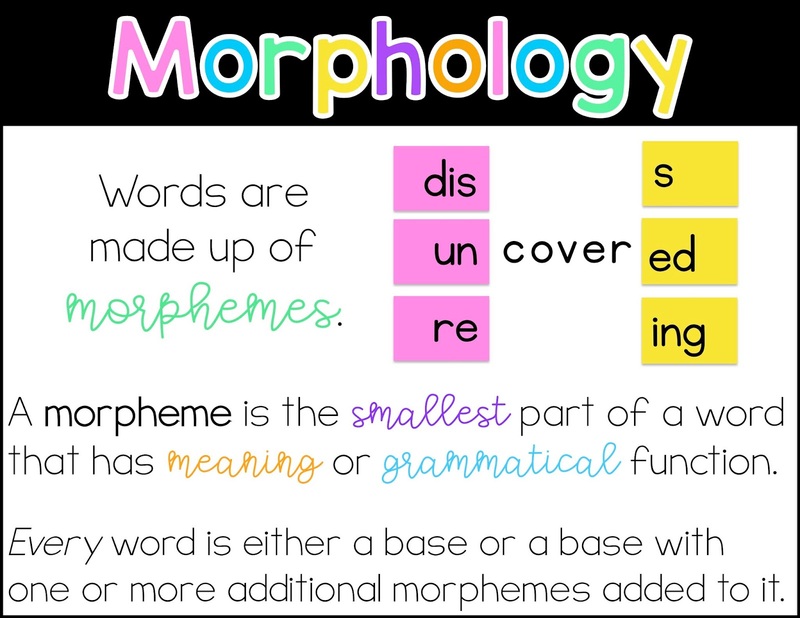 Think about all of those "sight words" like ago, again, away, about, around, across and how annoying it is that the a doesn't make its normal sounds. Do you have a lightbulb moment? Yep, all schwas! So technically, they are not rule breakers right? They are just schwas! Let's see if I can explain this correctly. When a word begins with the letter a and it is an OPEN syllable on its own (meaning its the only letter in the syllable), then it is usually a schwa (although I already thought of acorn as an exception). 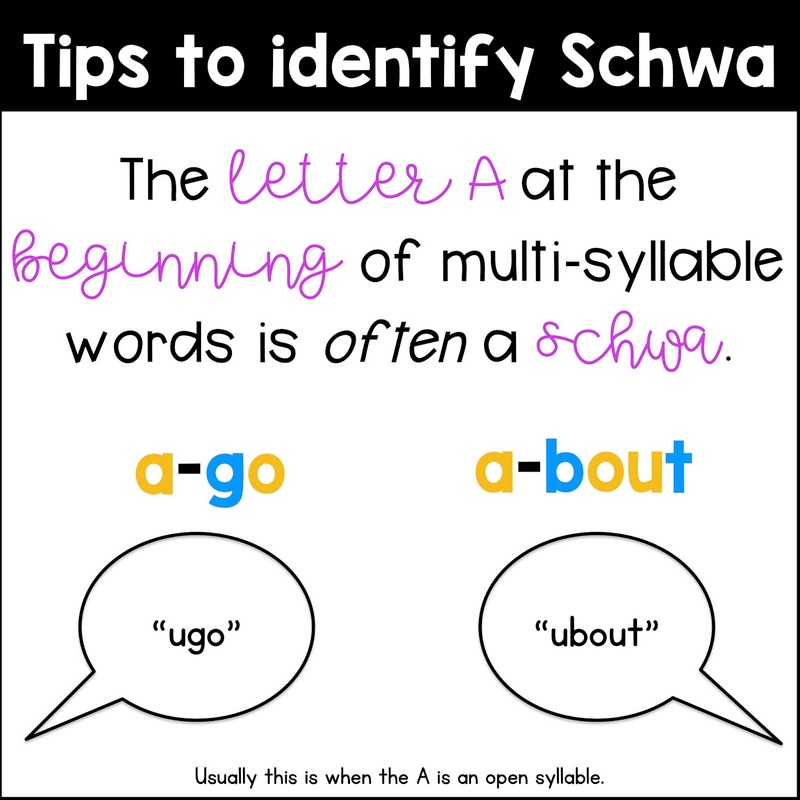 I also noticed when I was digging through words (yes, I literally just opened a ton of books searching for schwas), I noticed that there were some that were not open syllables that were also schwas, but the it wasn't consistently a schwa. For example, at-tend, ac-count, and --- all have schwas in the a which starts the word but they are not open syllables. But there are always words like ad-mit, ad-vice that don't sound like /uh/. I think though it's safe to tell our students to watch out for the schwa when a word begins with A. 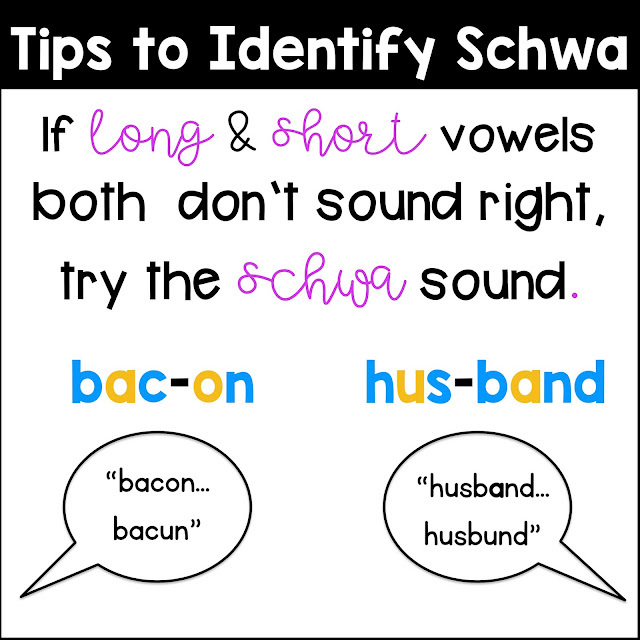 If it doesn't sound right with the other sounds A can make, try that schwa. Here's another one that is always a schwa (as far as I know). At the end of words when there is a vowel then an L, that combo usually makes this sound: /ul/. 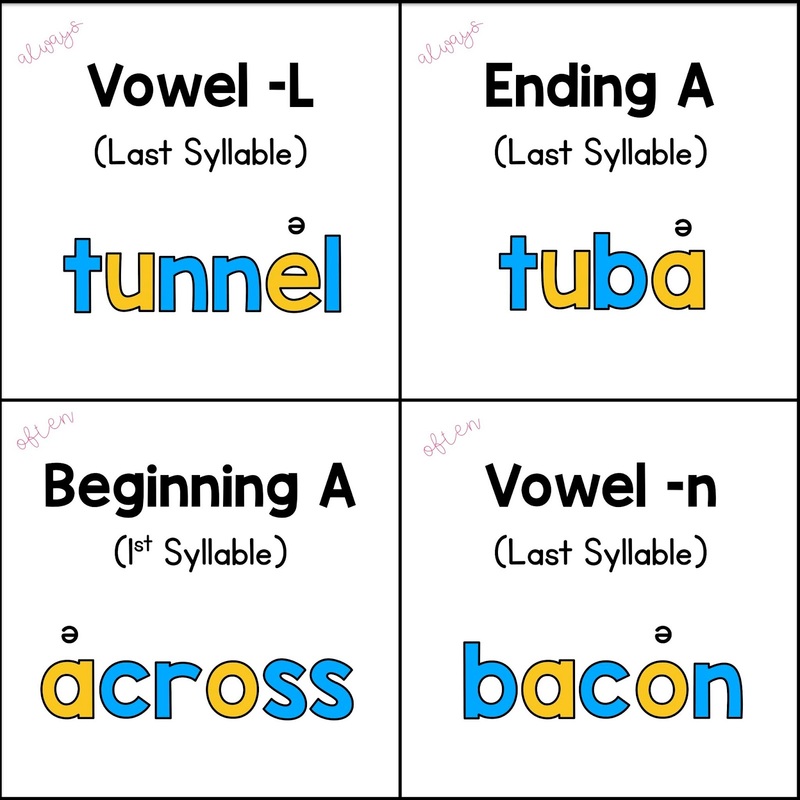 I think this one is a little more natural to fix once you've tried sounding out words that end in L. So you can now tell your students that if it ends with a vowel then an L, that vowel will be a schwa and you say /ul/. Make sure you specify that it is at the end of words, because anywhere else in the word, all bets are off. LOL! This last one is not a rule or anything, but just a consistent pattern that you'll see when you start looking out for the schwa. Often the schwa comes before the letter -n. It's often an A or an O. (In fact it seems like a and o in general have more obvious schwas than the others). 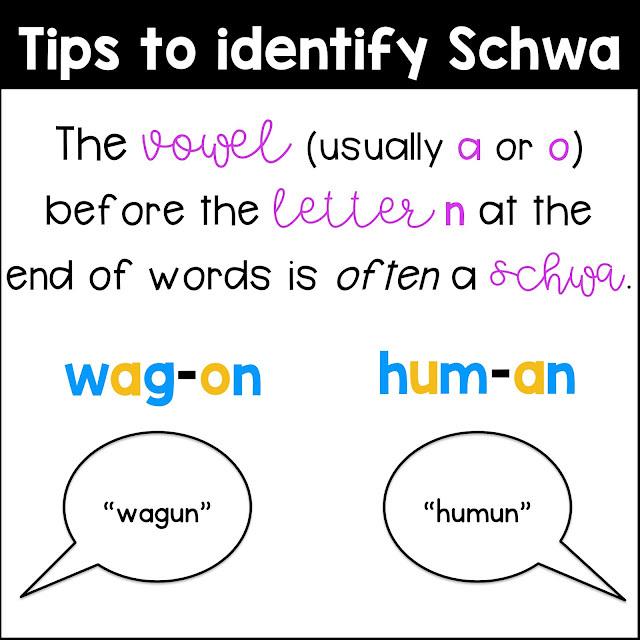 So if you see a word that ends with a vowel then n, that might be a good place to start looking for the schwa. 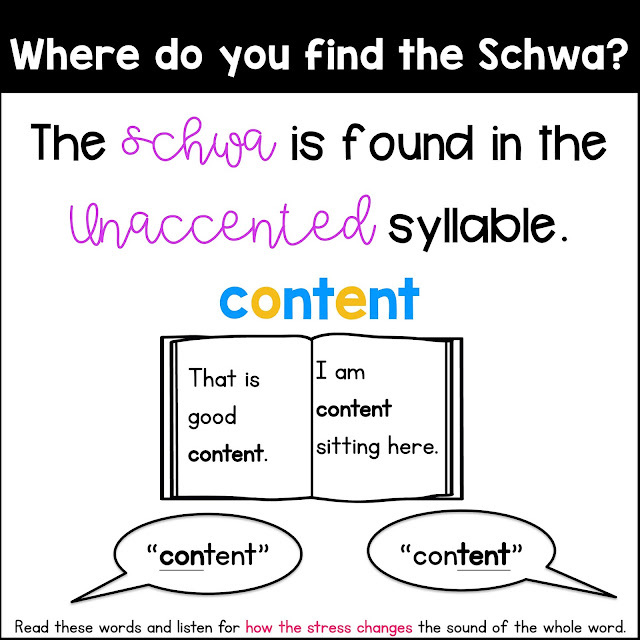 When students are sounding out words, if they know that is a common place that the schwa might be, they can get used to quickly substituting the regular vowel sound for the schwa sound if they get stuck. (Note: Even though I write always above some, I know that nothing is ever "always". I guess I meant usually or mostly. You get the point. Now spelling the schwa is a bit of a nightmare. There seems to be no real way to figure it out unless you just know which letter to use. Thank you spell check and dictionaries! That is a frustrating answer for our students who want the answers. It's true though. Can you think of any way to figuring out the o in wagon just from "sounding it out"? No! You have sound out the sounds you hear and learn that o is there from seeing it a few times. If your memory can't hold all of those, that's where spell checkers are key. And here is where i go on my soapbox about spell checkers being a great accommodation for our dyslexic learners. There are clearly so many words that need to be spell checked. We can equip our students with tools to come close to accurate spelling with phonics instruction and morphology instruction. But they will still get stumped. 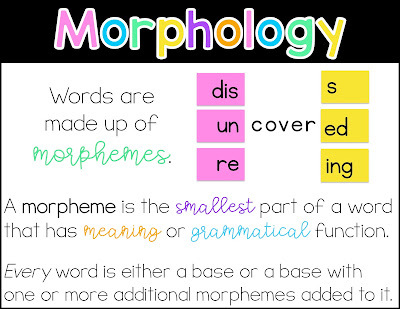 With a spell checker, they can still actively use phonics and morphology to get close and then find the actual spelling with the checker. 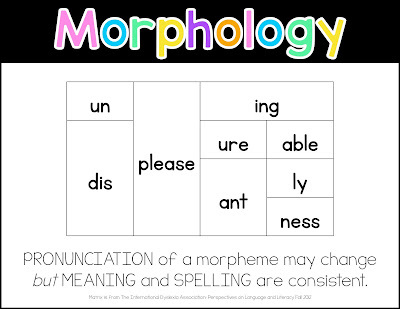 In fact, they still have to have phonics and morphology knowledge in order for that spell checker to guess what they are trying to say. This might sound crazy, but I think by fourth grade our dyslexic students should have access to a spell checker. You can get them for like $10! 1. 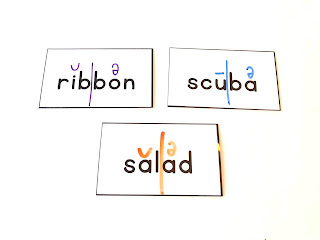 I use picture cards with the written word on them to first introduce the schwa. 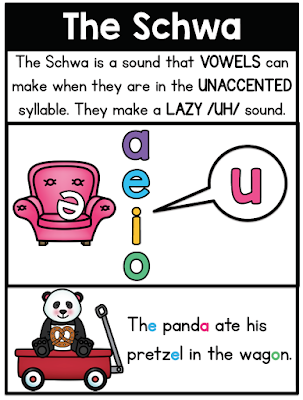 We look at the letter that seems out of place and that's how I explain what a schwa is. 2. Word building with letter tiles. 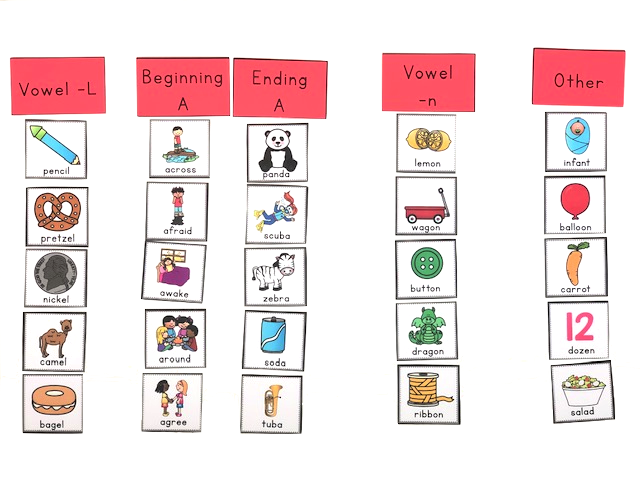 I teach the schwa during my 2-syllable open/closed syllable word unit. 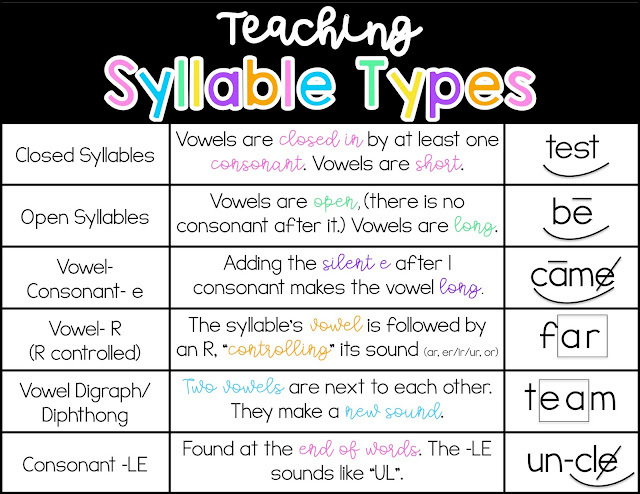 I teach syllable division rules first, but after teaching the first few, I see the need to throw in a few lessons about the schwa because it comes up so much! Using letter tiles, we practice our syllable division rules to break apart a word into its syllable parts. 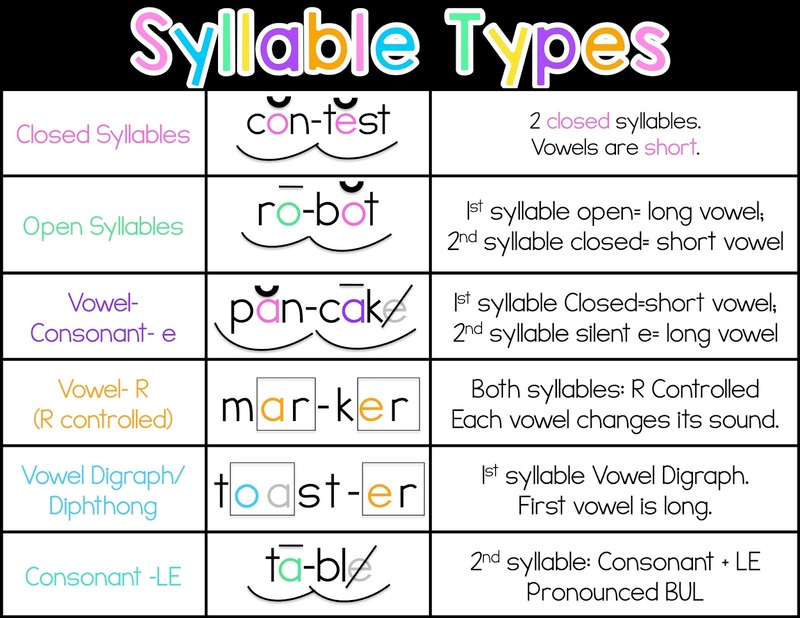 Then I point out the syllable that follows the rule and we label that vowel with the short or long symbol (at this point I have only taught open and closed syllables). 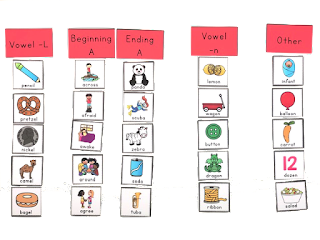 Then we look at the next syllable and I show them the label for the schwa and we talk about how to correctly pronounce the word. We don't actually say wag-on, we say wagun. 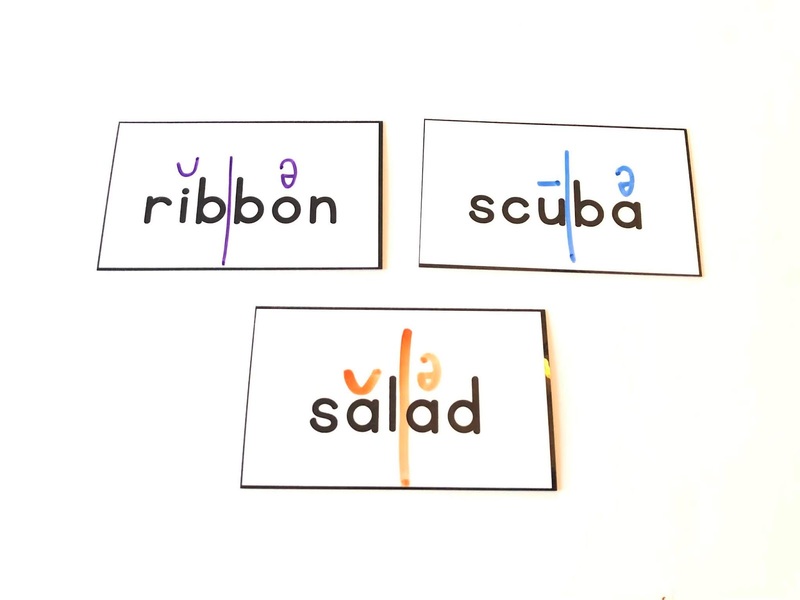 I give more opportunities to practice syllable division and labeling the vowels with the schwa. You can also just have them highlight the schwa. 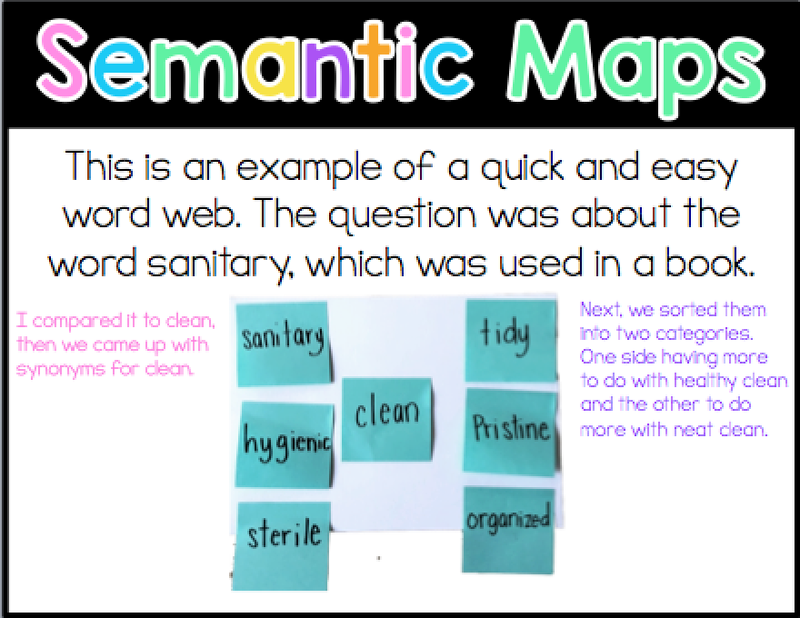 This activity is really helpful to do with a small group. They write one word at a time on white boards. They have time to do syllable division to decode. 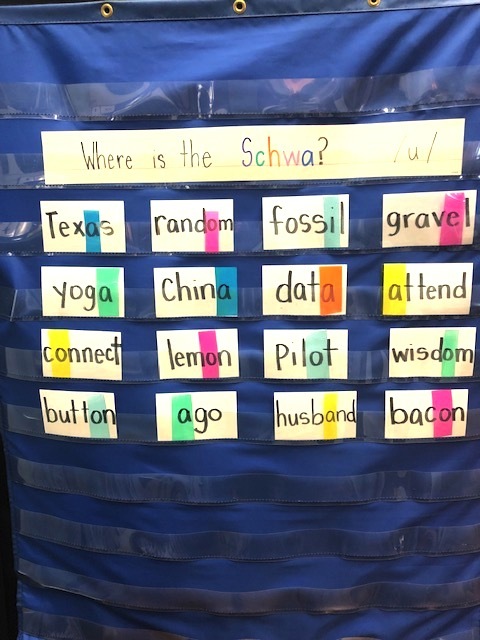 Then together we find the schwa and highlight it using these strips (transparent colored overlay sheets cut up). You can skip the white board part and just decode together too if you want. I do sorting activities with picture cards when I'm teaching the common places we see a schwa. Then I repeat with word cards. 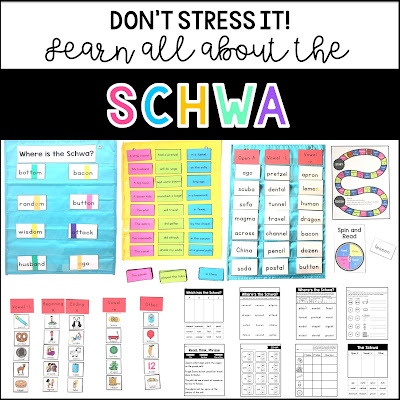 If you are looking for some teaching resources on the schwa, click here. I made a poster for the schwa that I'm sharing here today for free! Click here for this free schwa poster. You can download this poster by clicking on the PREVIEW. 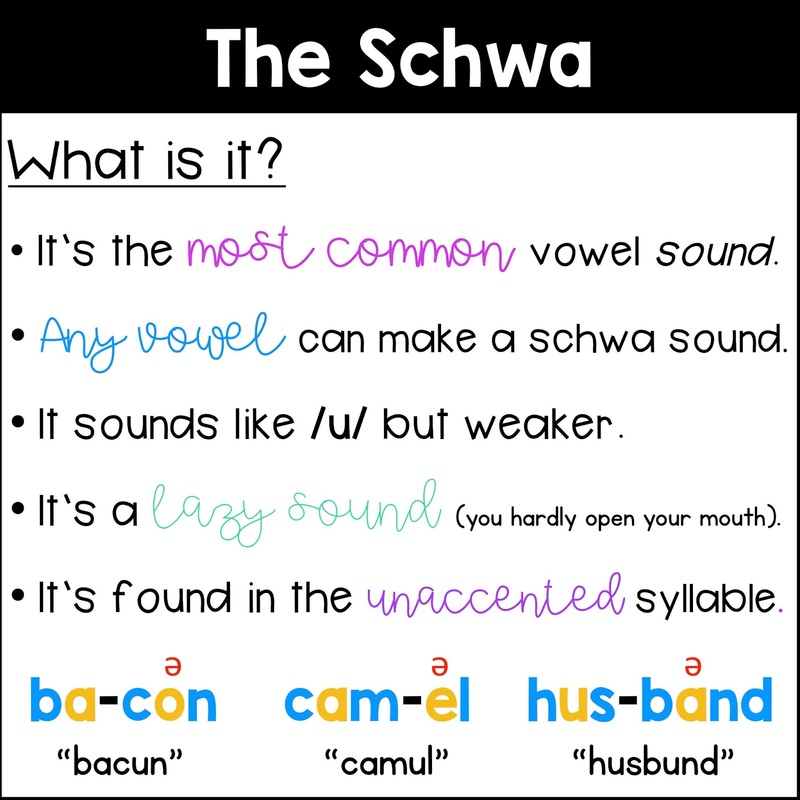 If you have more knowledge about the schwa to share, please do so in the comments. I know there is probably loads that I haven't learned yet! 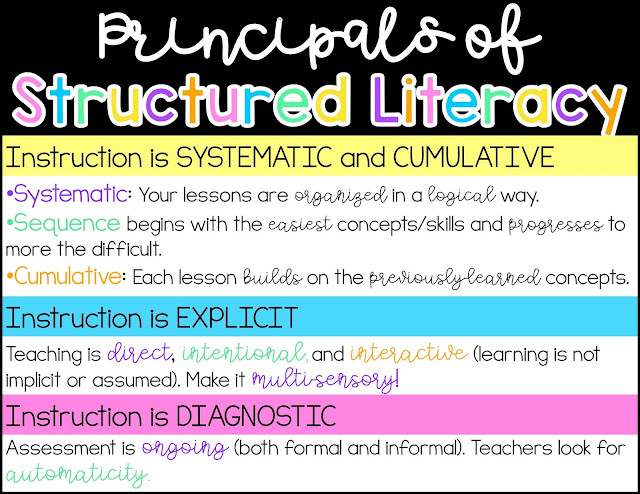 These are the key components of Structured Literacy. Each is equally important to building a strong foundation for our students. These elements work together and even overlap in some ways. I admit, I'm still learning myself! 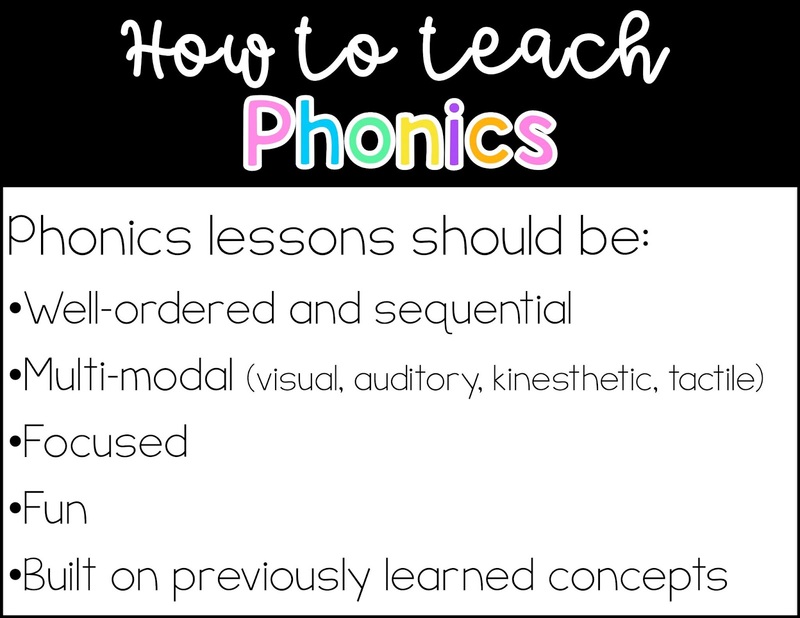 I have loved phonics instruction for a while now and started doing more syllable instruction a few years ago. Both yield great results. 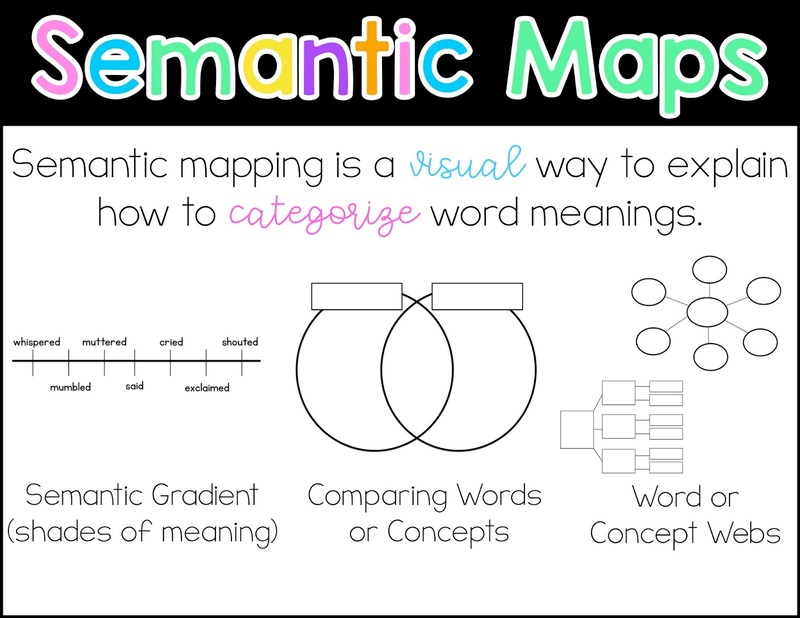 Now I am really digging deeper with morphology, syntax, and semantics! Morphology has been big missing puzzle piece for me. More about each later! No one can become an expert over night. That is have learned from experience. There is still so much to learn and I have been so impatient- I want to know it all! 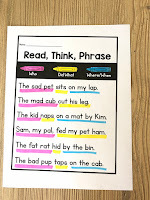 ;) BUT if you want to do something now, looking at how you are teaching reading skills should come first. These guiding principals have helped me so much. This was my step one. 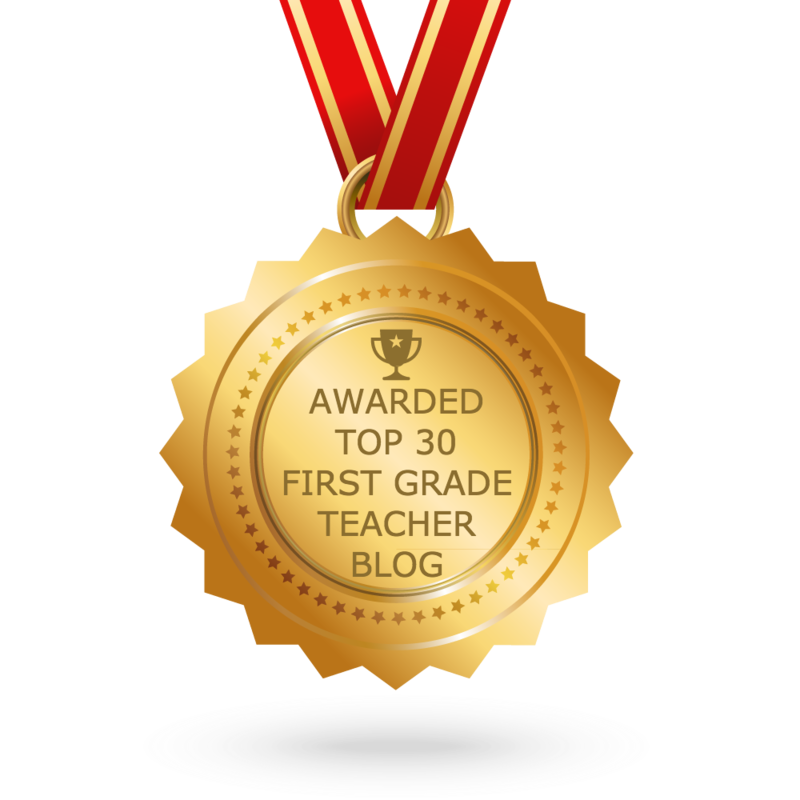 I became very reflective about how I was teaching my students. I now have a clear sequence. I always review concepts before introducing new ones. I teach each new concept in a direct way and then allow for plenty of opportunities for my students to practice in a guided setting. I make it multi-sensory. 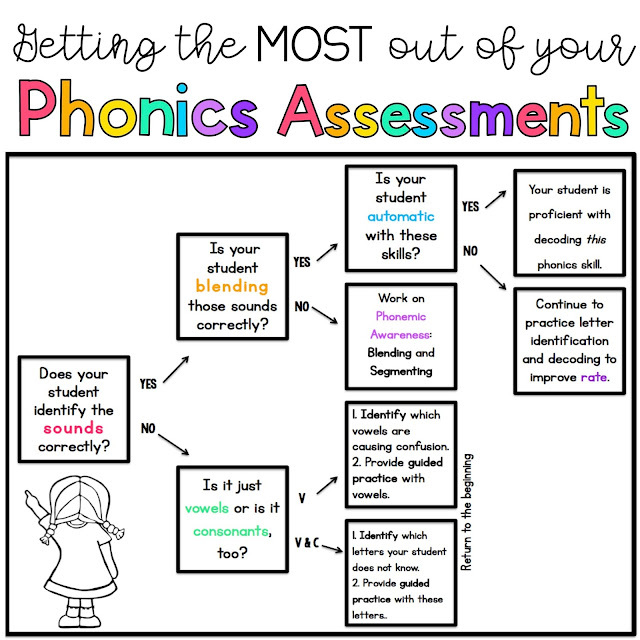 Like with anything in teaching, ongoing assessment is key. 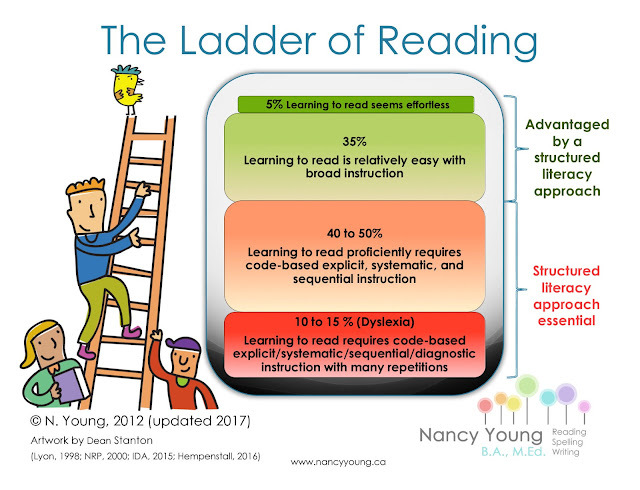 For our dyslexic readers, Guided Reading and Balanced Literacy are not enough. 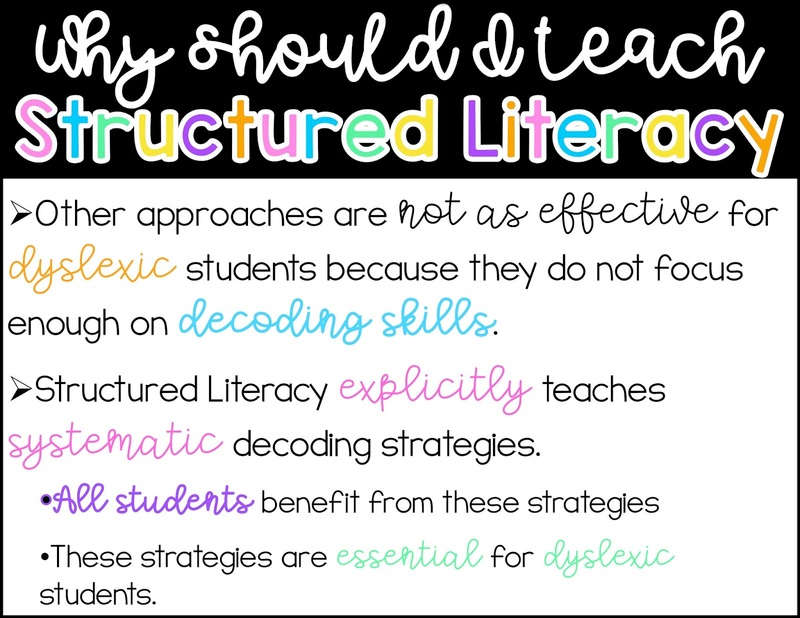 Structured literacy explicitly and systematically teaches decoding strategies that are necessary for our dyslexic readers. BUT, it doesn't just benefit them! It benefits all students. 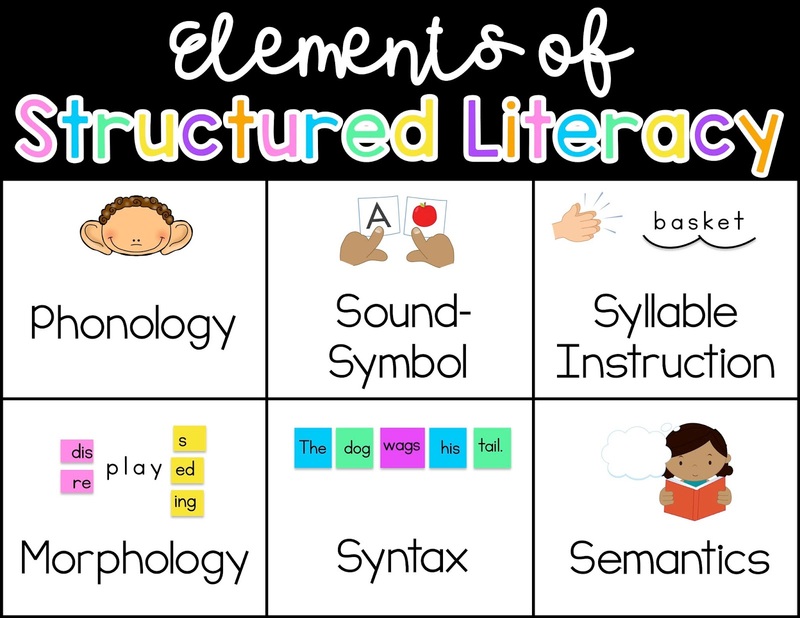 Although I am a huge fan of Guided Reading and Balanced literacy, I have come to learn it doesn't focus enough on word analysis and decoding strategies for our struggling readers. 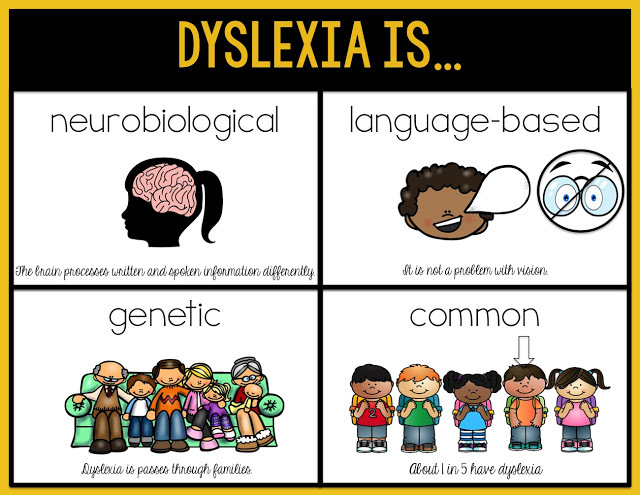 Since 1 in 5 of our students has dyslexia, it is important that we adjust our teaching to meet the needs of our students. 1 in 5 is a lot! This infographic below is super eye-opening! 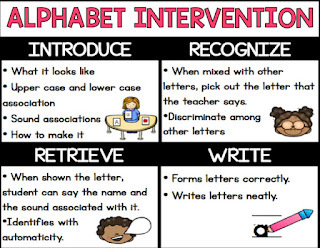 It was created by Nancy Young, who is a member of the International Dyslexia Association. I can literally picture every class of first graders that I've had and this fits pretty well. We have those few who seem to just teach themselves to read, right? Then you have those kids who seem to pick up easily and advance without a lot of extra effort. Then there are those kids that are always at benchmark, but do have to put in a lot of work. And finally, the 10-15% who struggle and who have us scratching our heads as to why. These are the kids that get stuck at level one of the lower guided reading levels and they can't seem to move on. 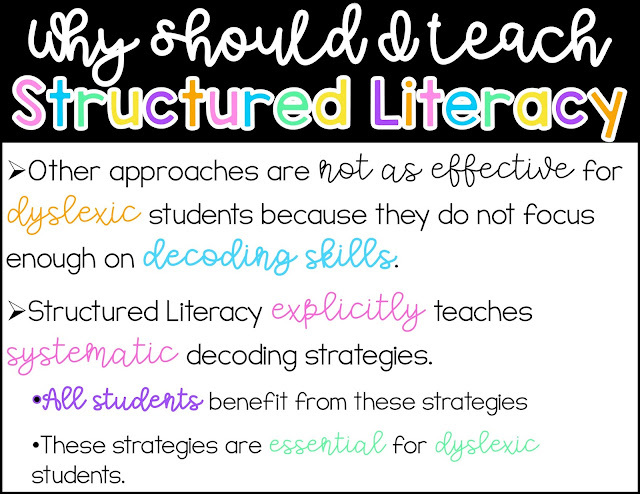 That's because they need more systematic, explicit instruction with decoding. You can read more about this infographic HERE. 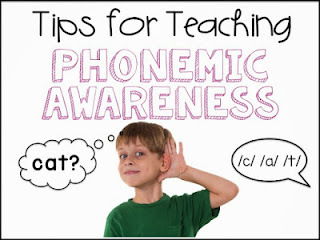 Click here to read more about phonemic awareness. Click here for tips and ideas to implement now. I also include fluency in this because fluency begins with automaticity at the word level. 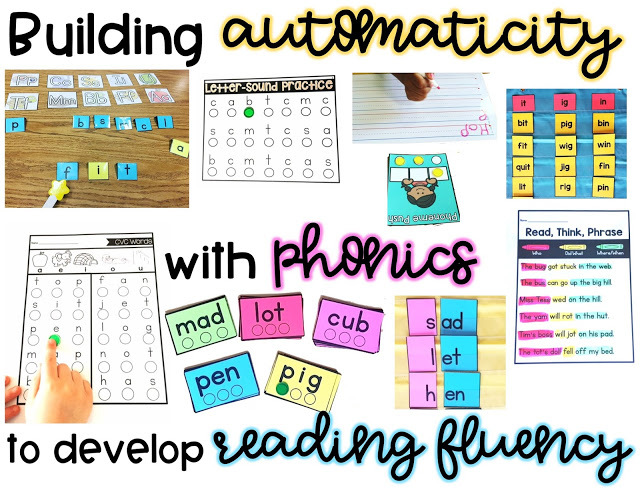 As students progress, fluency becomes rate, accuracy, and prosody (phrasing and intonation). 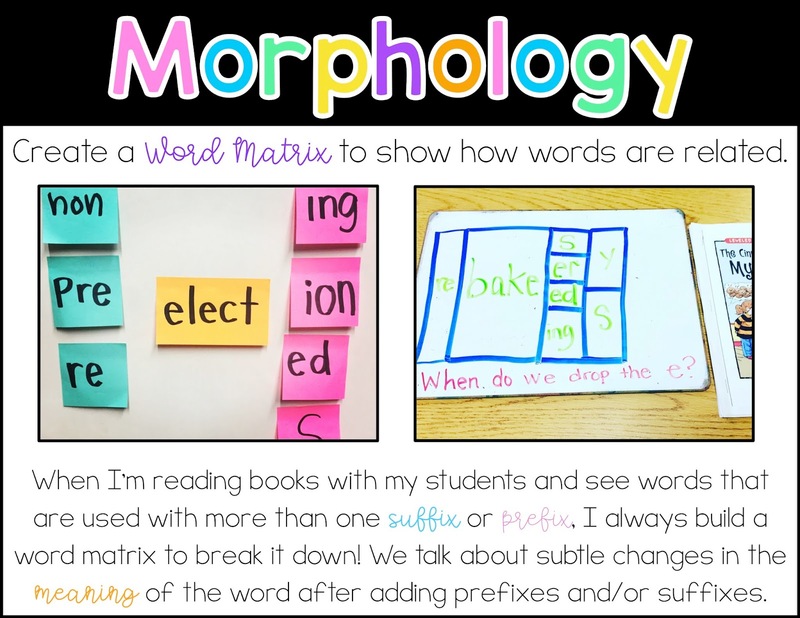 Teaching, modeling, and practicing fluency is incredibly important. I also think fluency ties in with syntax because understanding syntax helps our readers with accurate phrasing and visa versa. So, just because fluency is not one of the official elements, doesn't mean it's ignored. 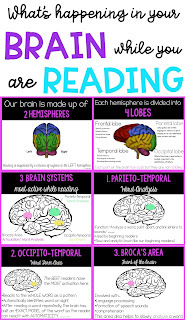 It is an essential part of reading. Click here to read more about how to teach phonics. 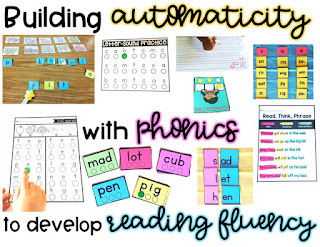 Click here to read more about fluency with phonics. 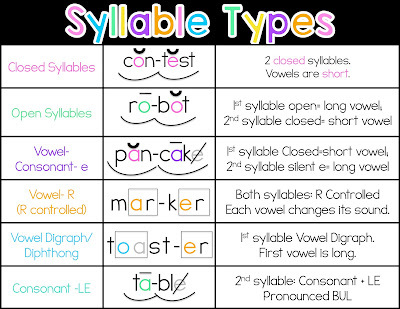 Click HERE to read a blog post about Open and Closed Syllables. 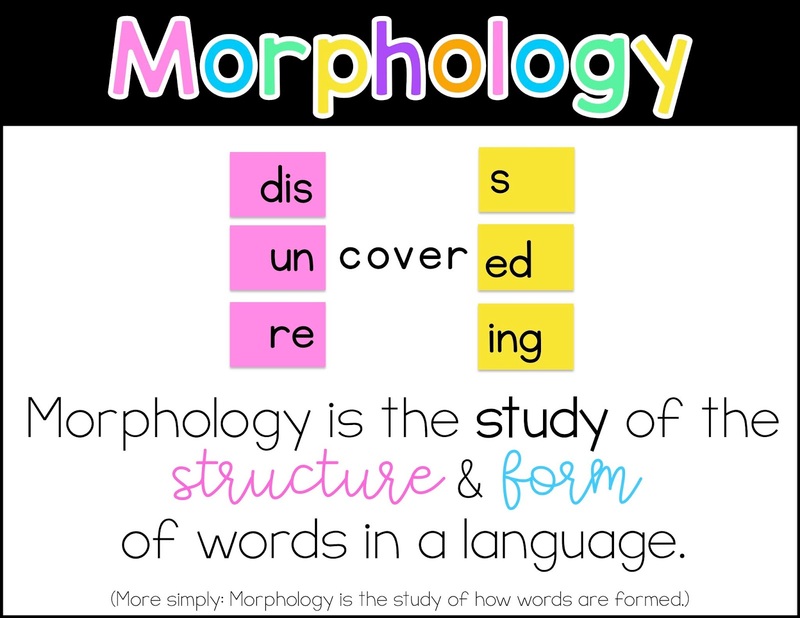 I hope to do a full post on Morphology soon! 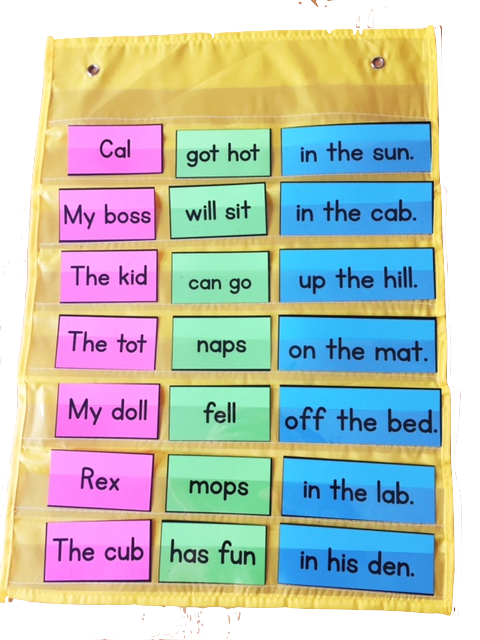 One thing I do now for my early readers is a Sentence Scramble and Sentence Building. This is syntax at the most basic level but it's a start, right? 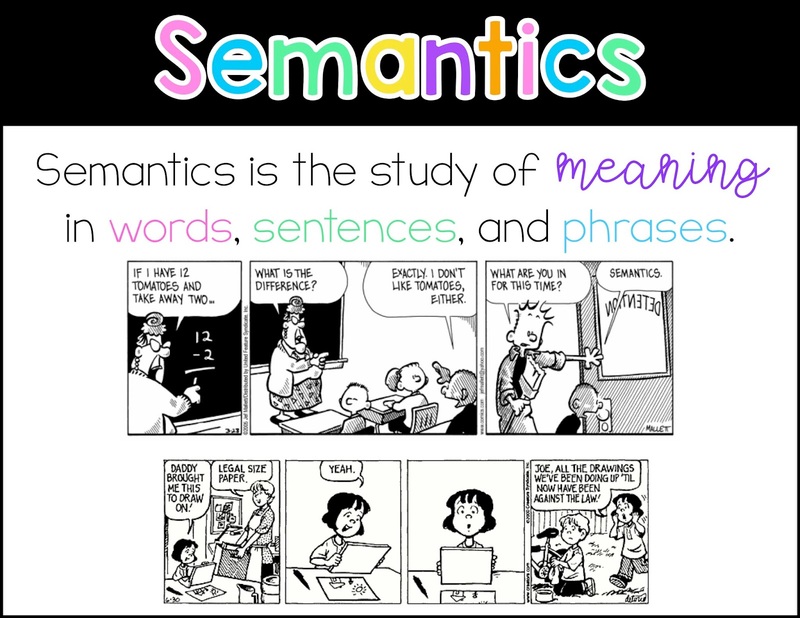 I love both of those comics because they illustrate how context and background knowledge affects our understanding of words and concepts. I have so far to go with my vocabulary instruction. I know this is an area that I do not do enough! 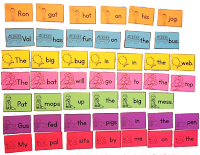 At a super basic level, an activity like this focuses on phonics, syntax, and semantics. 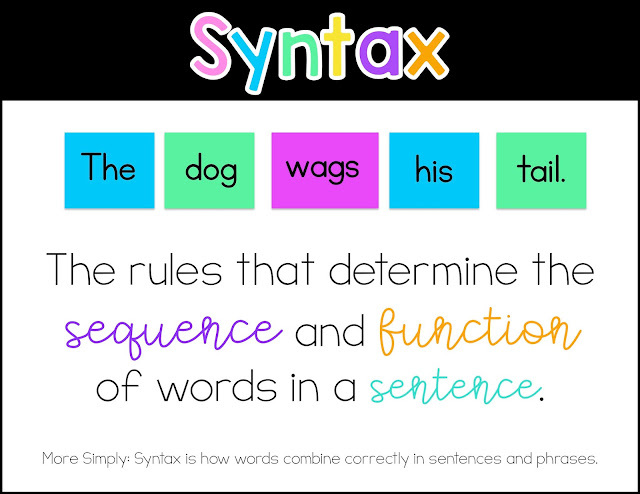 Students are decoding the words, looking for meaningful phrases that go together, and seeing basic syntax. I found this in my studies and thought it was super interesting. I ordered the book so I'll hopefully have a better understanding soon! Notice how the symbol cannot directly go to the referent. We must have conceptual understanding first (for a cat, that might be fury, pet, mammal, tail, cuddly, whiskers). There are so many people out there who have more expertise in this area than I do. 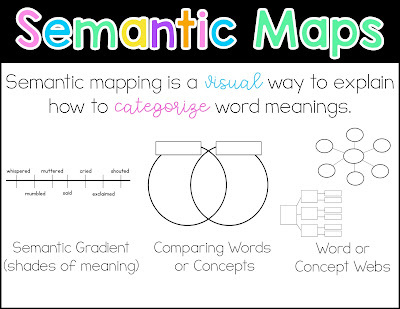 If you're interested, look up Semantic Maps and you'll find some great info. 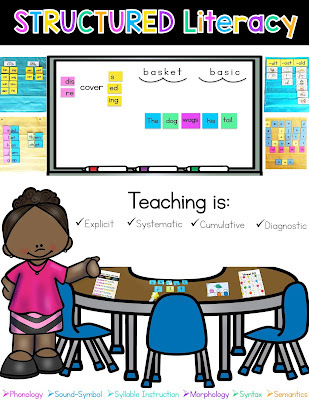 There are some great resources on TPT as well. 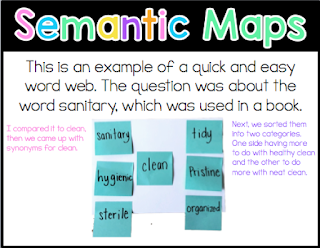 My friend Miss Decarbo has excellent vocabulary resources for our young readers. I would love to hear your thoughts. This is a lot to take in and a lot to figure out. I do believe we can incorporate Structured Literacy without saying goodbye to parts of Balanced Literacy. 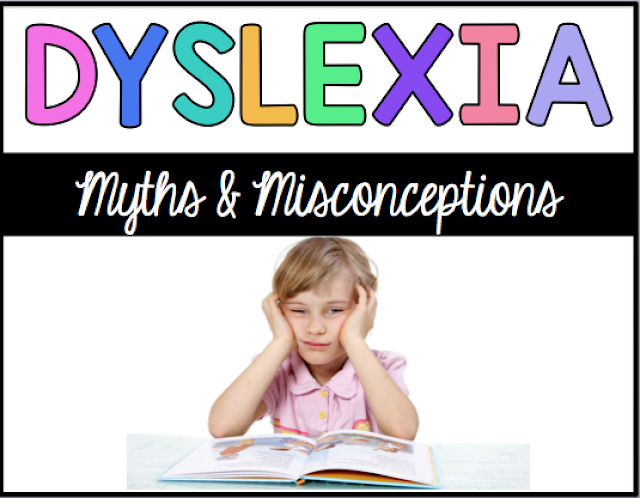 To read about common myths about dyslexia, click here. Hello! 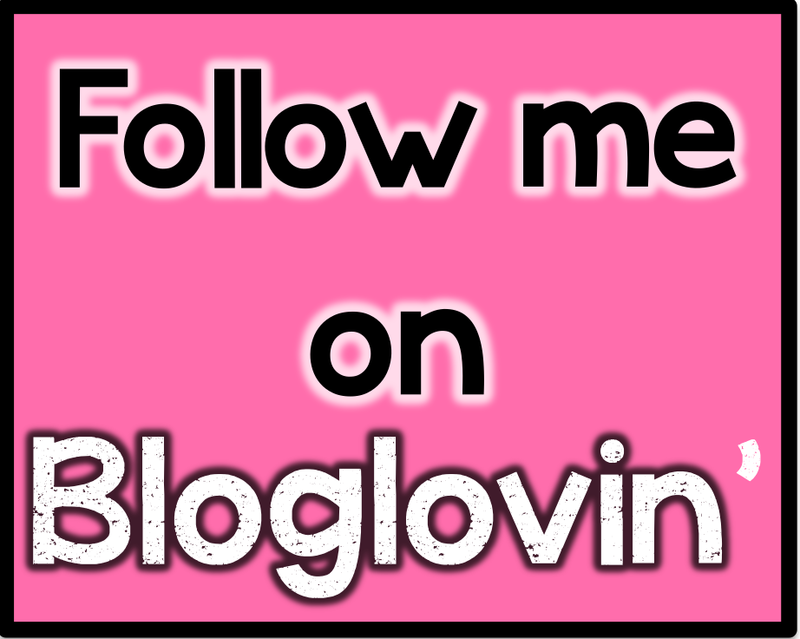 I have so many blog posts that that are half done so my goal this summer is to get them all finished to share with you all! 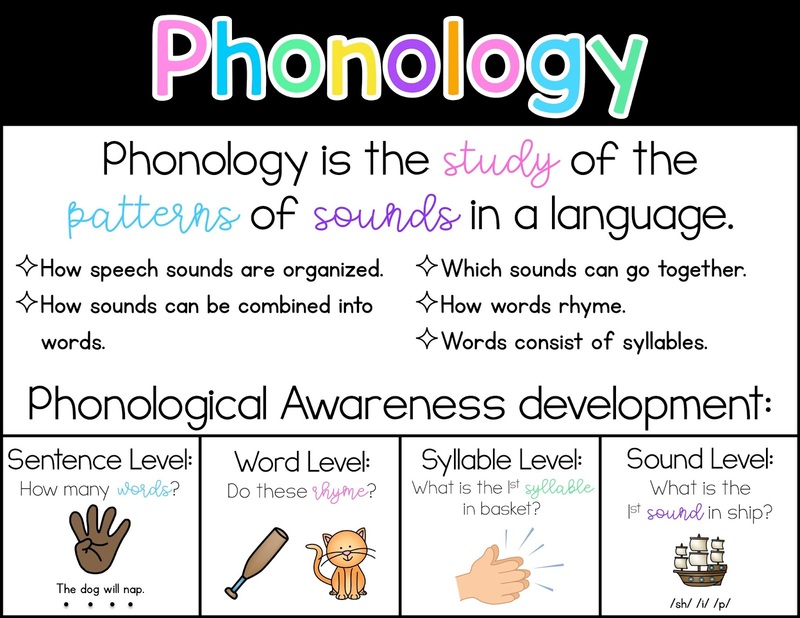 This first one is part of a series focusing on phonics. 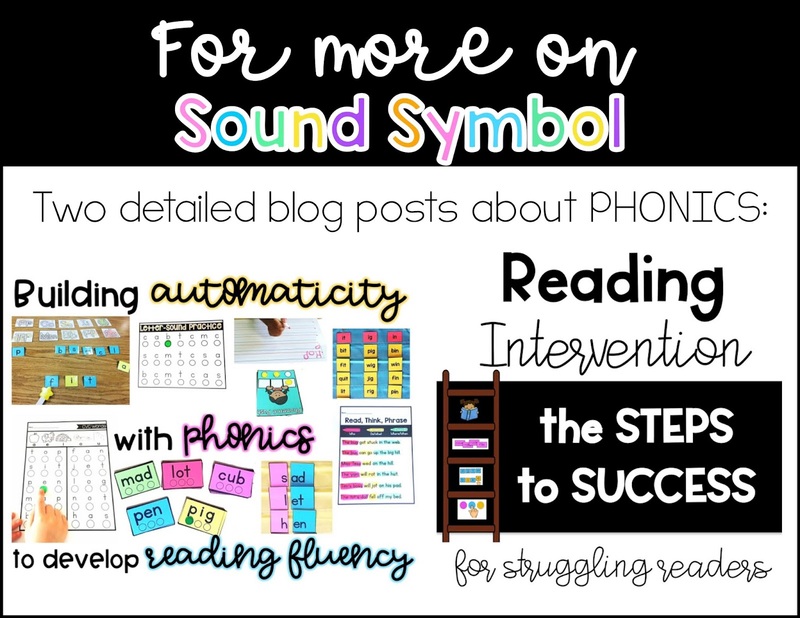 At the end of this post, I'll put the links to the other phonics posts, too. This post is all about interpreting your phonics assessments to best meet the needs of your students. 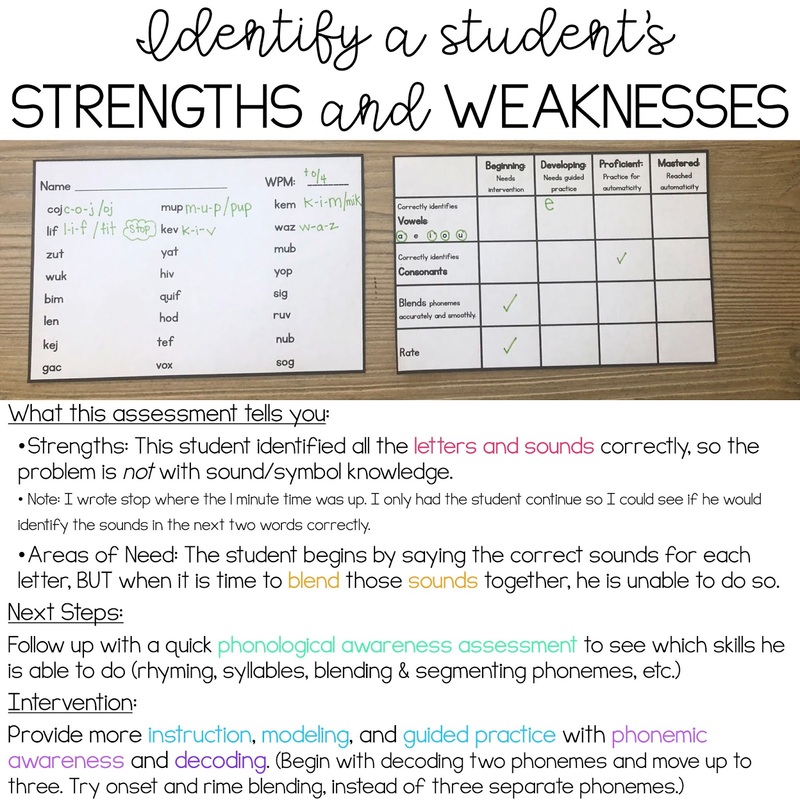 We can learn so much from a simple one-minute assessment. Side note: I've talked to several teachers who have adopted a leveled guided reading program as their main reading instruction, so they mostly use DRA's for assessing student's reading. Phonics assessments are still SO important, no matter what assessments are mandated at your school. I actually do both so I learn a ton about every student. 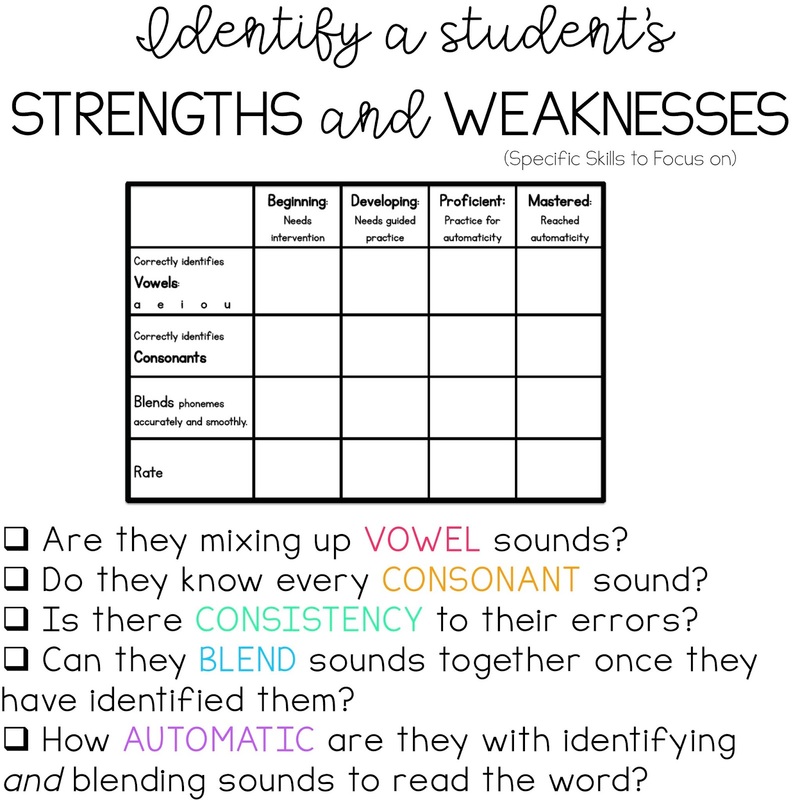 These are especially important in K-1 for identifying students at-risk for reading difficulties and dyslexia, but it is also important for all students. 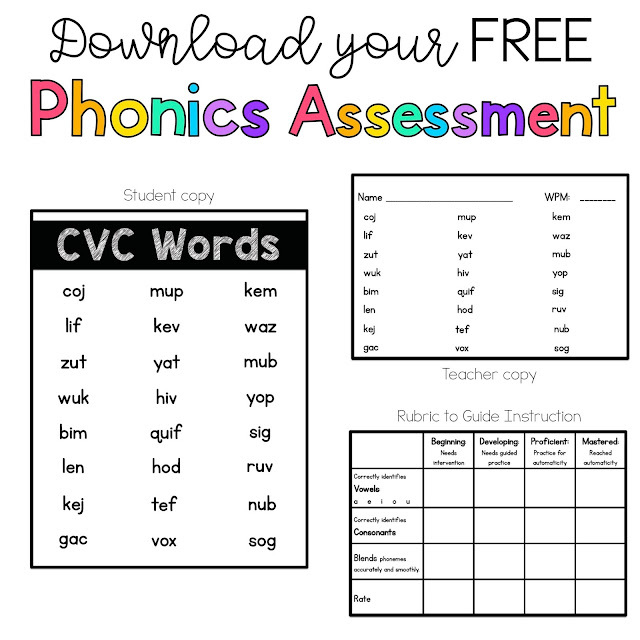 I start with CVC nonsense words for beginning readers. 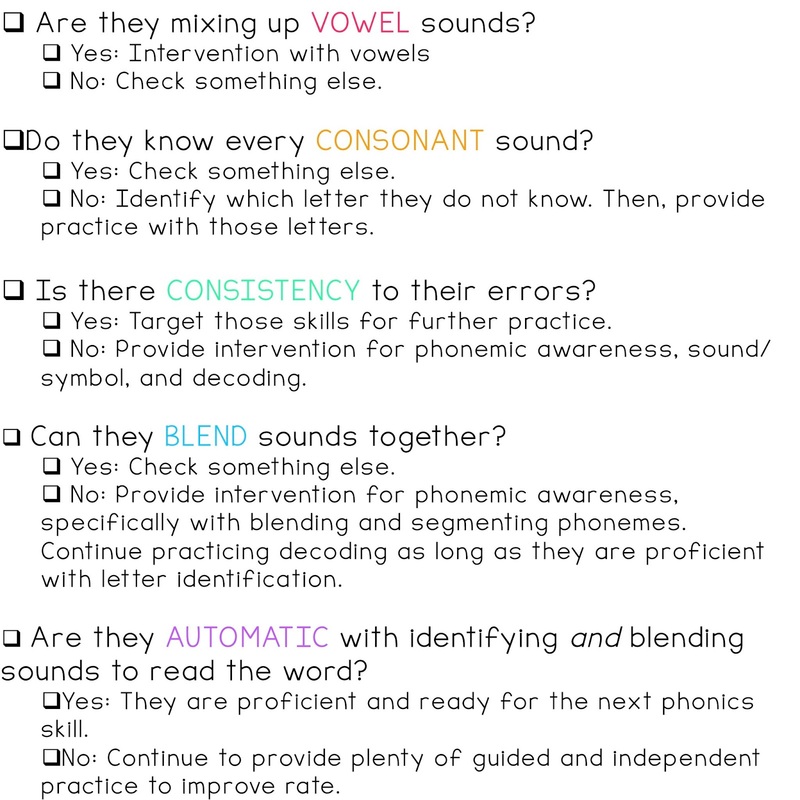 This post mainly focuses on that, but the same ideas apply to advanced phonics skills. While a student is reading the nonsense words, I take note of the sounds they make for each letter, their ability to blend phonemes, their automaticity with identifying sounds, and their rate for reading each word (do they go sound by sound or onset-rime and then blend or are they reading the whole word). The picture above shows you some of the notes I take. The one in the green shows c-u-j, which means that the student sounding it out sound by sound. I'll put c-uj to show if a student decodes with onset and rime. 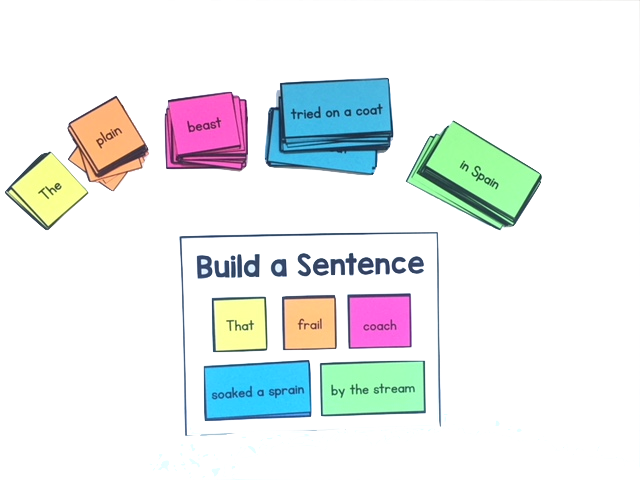 The one in the blue shows that the student just read the whole word without going sound by sound. When it is correctly read, I simply put a check. 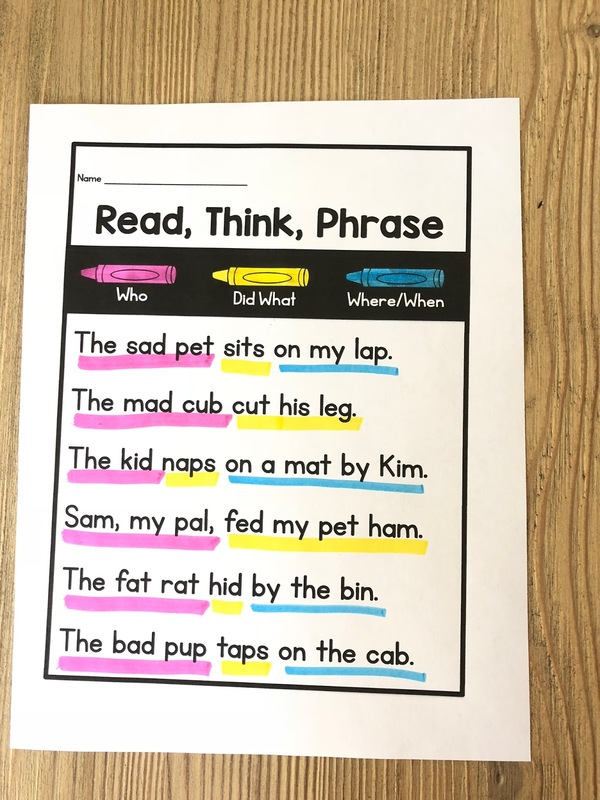 When it is read incorrectly, I'll write the whole word the way the child read it. 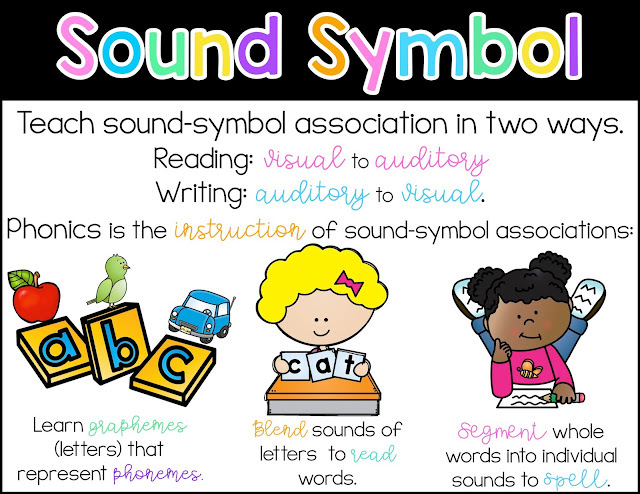 This shows that the child did not decode sound by sound, but rather read it as a whole word (but read it incorrectly). The green also shows what it looks like when the student says the correct sound, but then blends the sounds together incorrectly. For example, "m-u-p/pup" means that the student said the correct sounds for the letters, but then read pup instead of mup. I ask myself these questions to help identify a student's area of need. You can download this Free CVC word phonics assessment with the rubric by clicking here or the picture below. 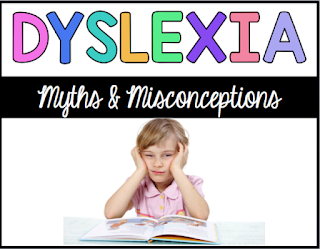 How does a nonsense word assessment help you identify a reader who may have dyslexia? 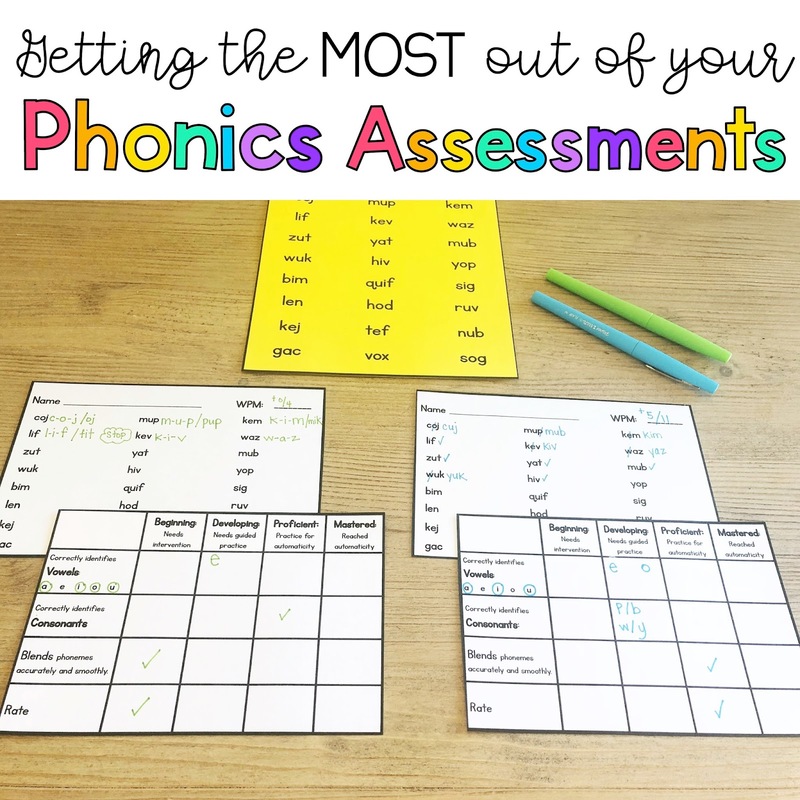 This quick snapshot measures a student's ability to blends sounds together (which requires phonemic awareness), their alphabetic knowledge, and rapid naming ability (how quickly and automatically they can identify letters and their sounds. Deficits in any or all of these skills can be signs of dyslexia. 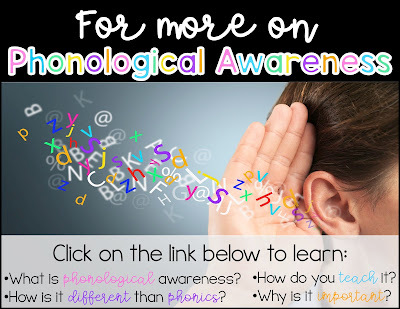 Poor phonological processing is a distinguishing feature for students with dyslexia. 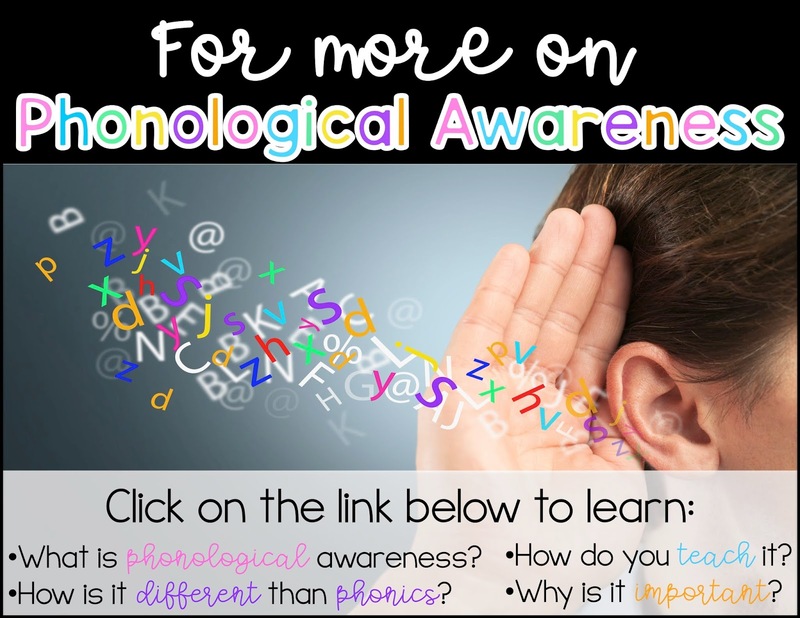 Lack of phonological awareness can be a predictor of reading disabilities. 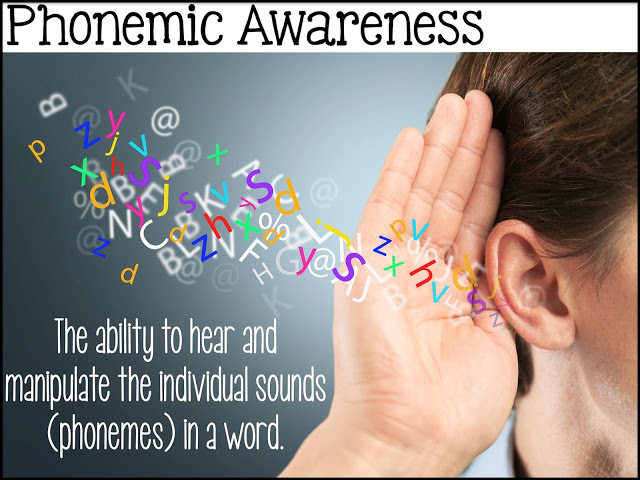 In order to read nonsense words, students must have phonological awareness. 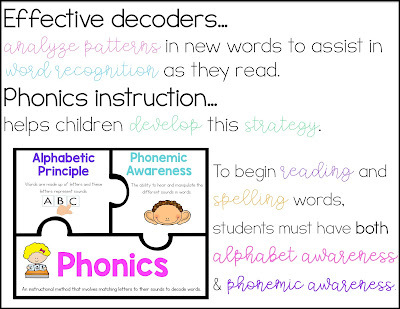 When they blend the sounds together to read the word, they are demonstrating phonological awareness. When they cannot do that, they are showing you a weakness in phonological processing. This simple, quick assessment cannot identify dyslexia on its own, but it does give you a quick snapshot of who needs extra intervention and it certainly can get your teacher feelers up! 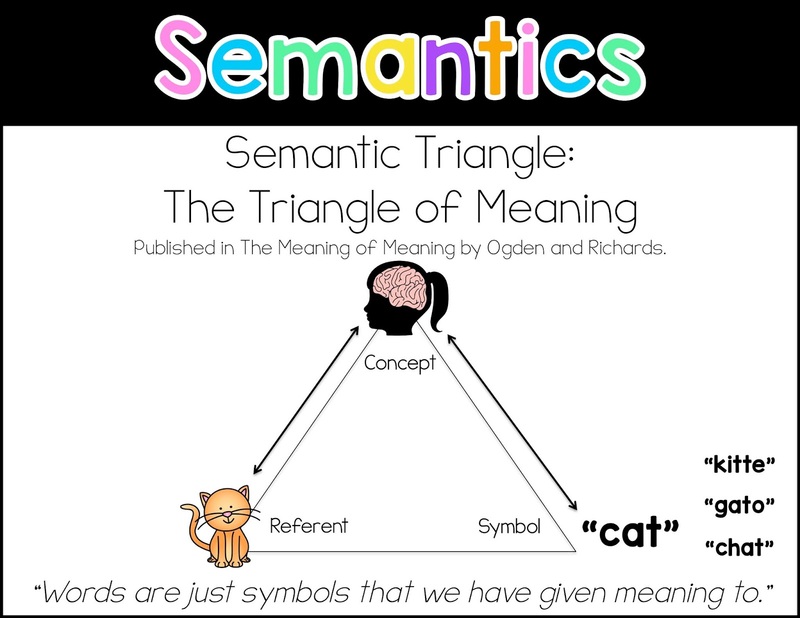 Why nonsense words instead of real words? There are some students who lack phonemic awareness, but actually have a good memory for letters and words. In these cases, a teacher may not notice they have issues because they could be "sight reading" (they have enough words memorized that they can get through simple texts along with picture clues and context). It will catch up to them though! We want to make sure they get the intervention they need early on. I have heard many teachers say, "I don't know why they are struggling. They know all their letters and sounds but just can't sound out words!" 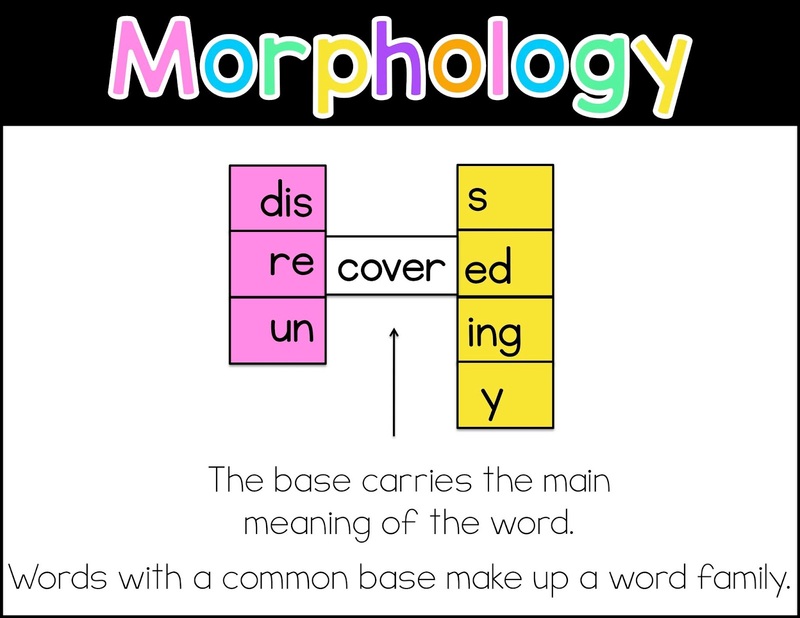 I have had students who memorize many of the common CVC words, but then when you show them a nonsense word, they are unable to actually decode it. 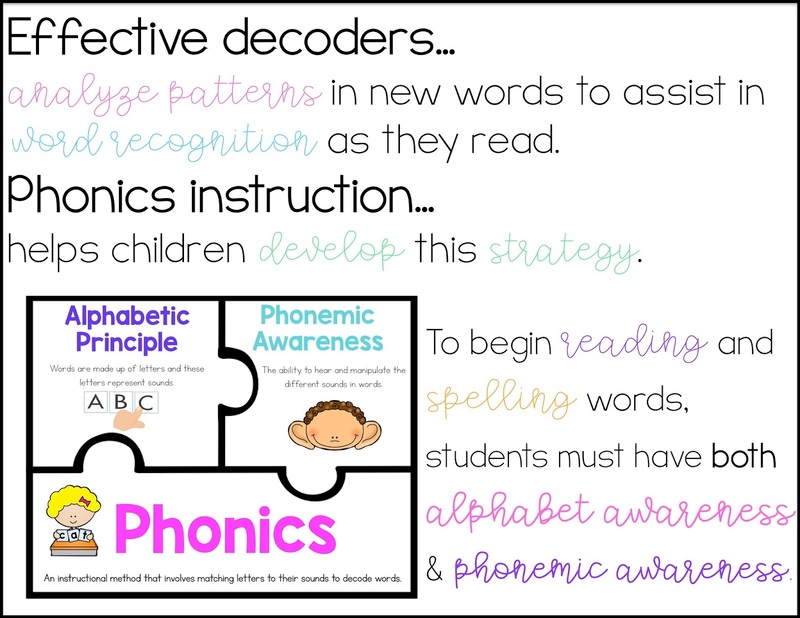 With this assessment, we are truly evaluating whether or not a student can decode. Some students have the opposite problem. They have strong phonemic awareness, but they really struggle to remember letters, their sounds and later, sight words. 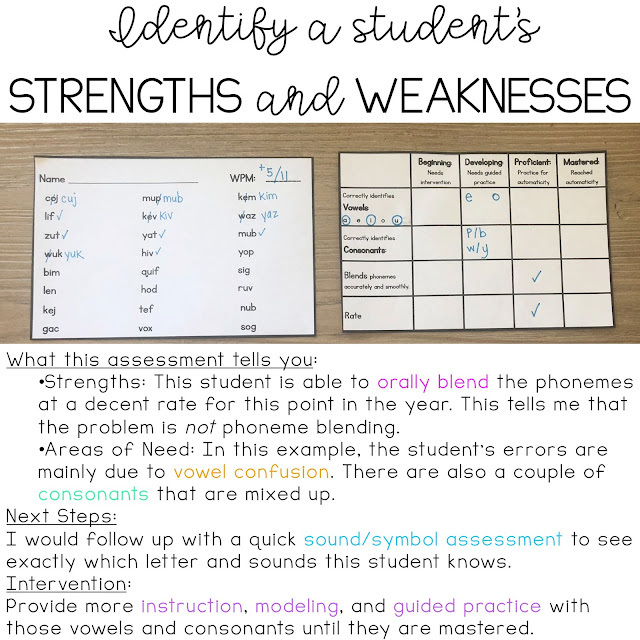 These students have Orthographic Dyslexia.These are your students who can't remember a sound associated with a letter or who take a very long time mastering all the letters in the alphabet. They also have a hard time with spelling. 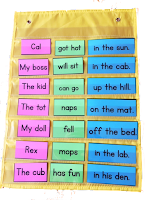 They spell completely phonetically and can't seem to remember the spelling of even the most common sight words. 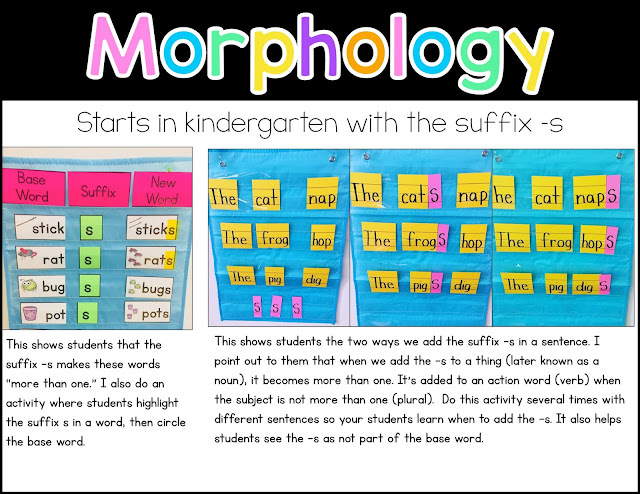 Later in first grade, they may be able to sound out most words quite well, but usually very slowly. 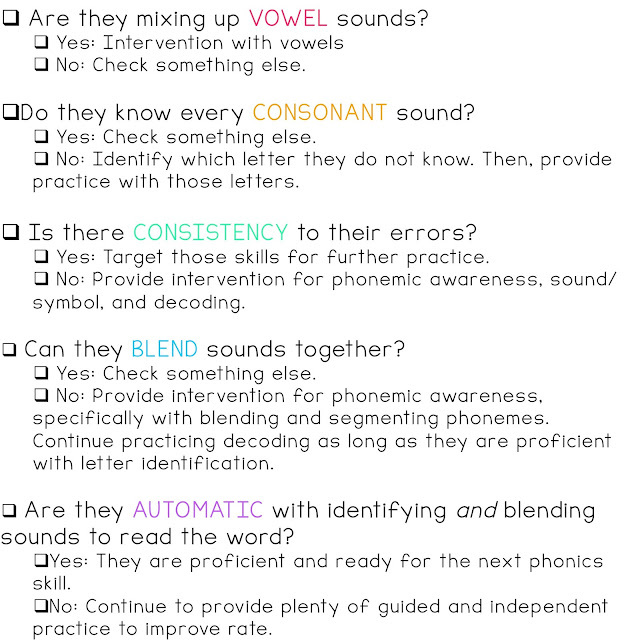 This assessment helps you to see those children who may be showing early signs of orthographic dyslexia. 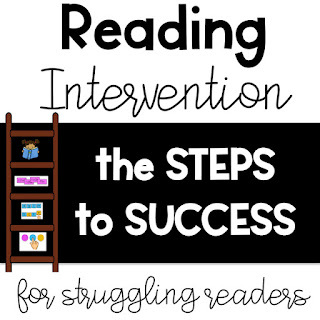 So what should you do when one of your students is struggling in one or more of these areas? I have a few blog posts that may help. Read more about phonics here. 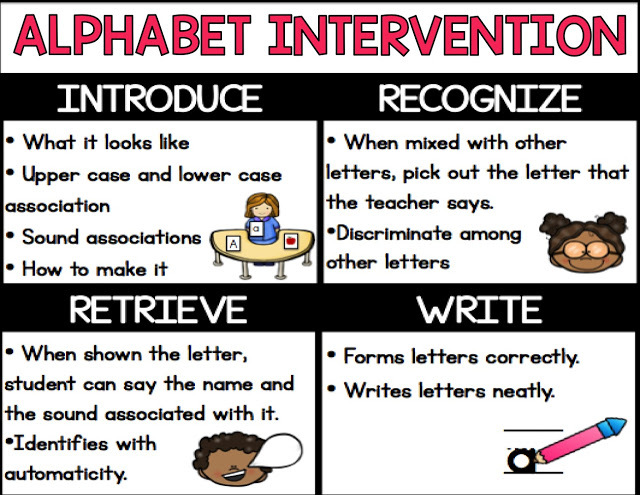 Read about Alphabet Intervention Here.